To say that we are feeling LOVED is an understatement! Tuesday brought birthday wishes and love and yesterday we shared the big news that baby Hart #2 is on the way (post here). How can this week get any better? Sunday Jon mentioned that he had asked my mom to watch Ford overnight on my birthday so I knew a surprise was coming. Monday he was bursting at the seams and spilled the beans. He planned a night away at a hotel in downtown Austin, dinner at a unique, foodie, Austiny place, dessert, live music, and lots of birthday spoiling. Ford gifted me a Snoogle pregnancy pillow (yay!) and new sweater and pair of sweats, he knows his mama well. If this wasn't enough, Jon handed me a card with a flight itinerary to go to Chicago in a few weeks! Chicago is where I am originally from and most of my family is still there and we are really close to them. We'd been toying around with the idea of going up there and one of the many things I love about Jon is he never stops surprising me. I am the queen of planning and preparing so he never ceases to amaze me with surprises! We had a great doctors appointment in the morning and saw our sweet and healthy baby, grabbed a quick lunch at Noodles & Company, and headed downtown to check into the Sheraton Austin. They upgraded us to deluxe corner room (thanks to Jon being Starwood Platinum) with the most beautiful view of the state Capitol and Austin skyline. I would not trade my life for anything. I am 26 with a beautiful family and spend my days wiping butts and folding diapers but I wouldn't change it for the world. However, it is such a blessing to get away with my husband and be carefree and young, even for just a night. We ventured onto 6th street and grabbed drinks at a bar and settled in for some live music. I felt 100% lame drinking water but I don't do caffeine so sodas are out and juice is loaded with sugar which I knew I would be pigging out on later. Thank you to Jon for drinking for the both of us. Austin is a funky city known for live music, hipsters, and everything "weird". There are so many fun murals around the city that are definitely picture worthy. 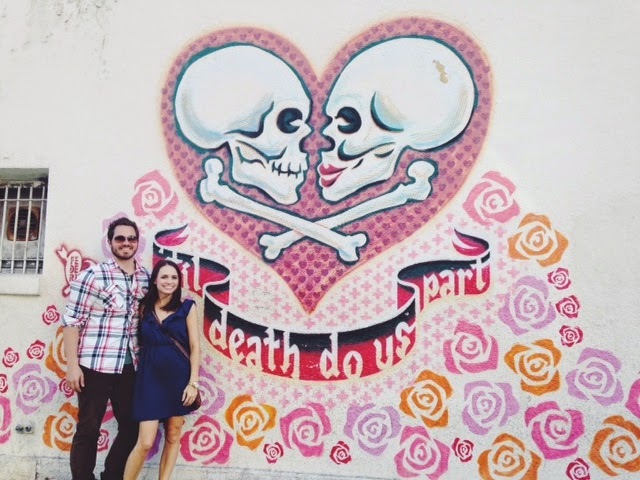 Our couple's wedding shower back in 2010 was themed around this mural and we finally got around to taking a picture! Based on a lot of comments on yesterday's Instagram pregnancy announcement, I am totally rocking a bump here?! Many of you said you had a feeling...funny how quickly your body gets into pregnancy mode with #2! 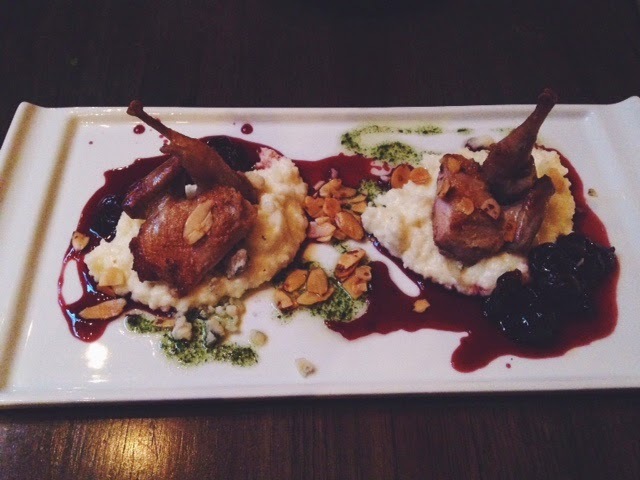 We ate dinner at Swift's Attic and it was incredible. We had to laugh coming from NYC a few weeks ago and eating lots of "family style" meals because this was quite the opposite. Very foodie/farm to table/interesting/TINY plates. But oh so good. SO GOOD. I highly recommend it for a special date night but just a heads up, you won't leave full (which is a good thing sometimes) and it's easy to drop $75 without wine. Sweets are my drugs and when we realized there was a Truluck's a block away from dinner, I was giddy. 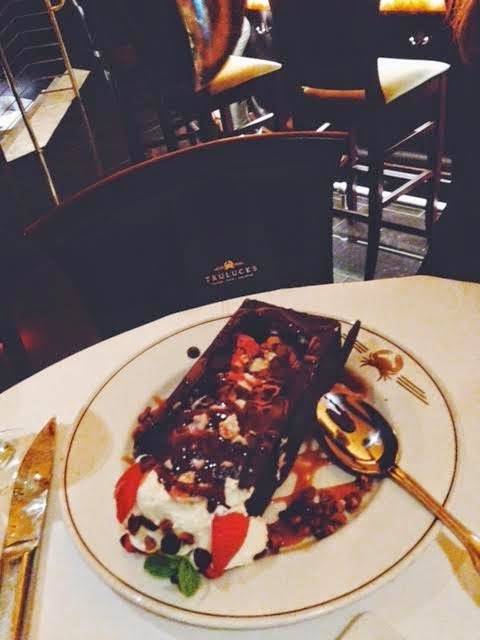 Deciding on a dessert was quite the ordeal and we went with our favorite, the chocolate bag. Do yourself a favor, book a babysitter, and go get a chocolate bag tonight. They aren't cheap but it is a fun date night in itself. We've gone and got $10 burgers and ended the night at the piano bar at Truclucks with a chocolate bag. Worth it. 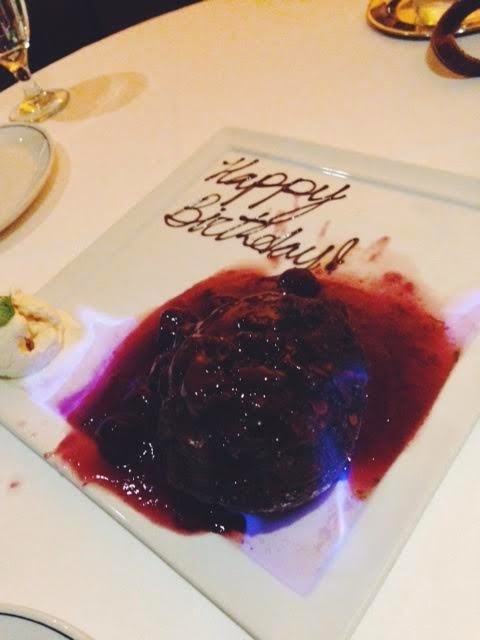 Because it was my birthday, they also brought out a flaming chocolate bread pudding that was oh so good! We devoured the entire chocolate bag and half the pudding...making up for dinner ha. We enjoyed walking around 6th street on a weekday without 100's of Bachelorette parties and drunk college students flooding the streets, it was such a beautiful evening too. Funniest part of the night, we were in a store on 6th and a sweet couple recognized us from House Hunters and asked for a picture! It was hilarious and so fun, hello to our new Oklahoma friends! Later that evening the concierge dropped off chocolate covered strawberries and champagne to our room, seriously all the stops were pulled out. Jon and I slept 10 hours, had a delicious brunch at Magnolia Cafe, and were so excited to come home to our little Fordy boy. I feel so blessed to be so loved on on my birthday. By friends, family, and most of all, my one of a kind husband. I have a lot of planing to do for his next birthday in April! 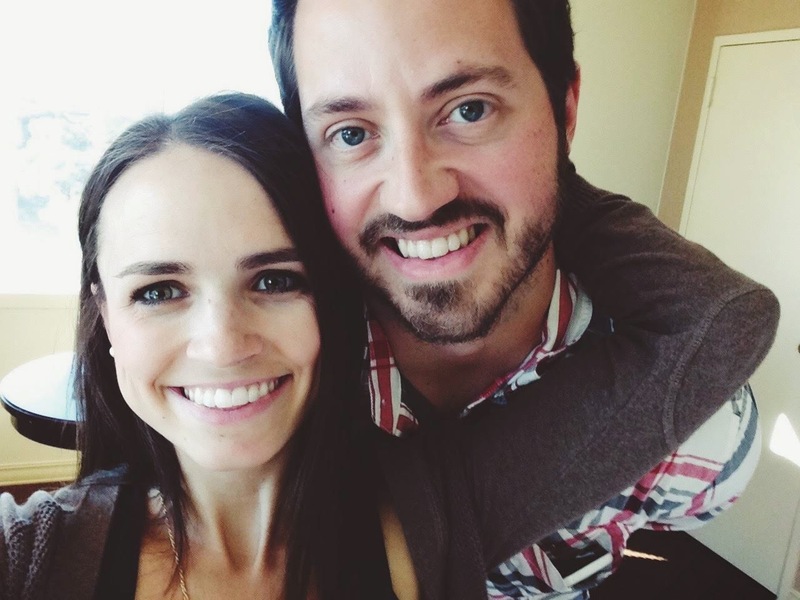 Come back tomorrow for info on baby hart #2! I'm glad you had a wonderful birthday!!! What days will you actually be in Chicago...I will be there too very soon for work?!?! Happy belated birthday and CONGRATS on the baby news. Such exciting time for your family!! What a fun birthday! Yay for growing families! Two babies are SO much fun. That sounds like a great birthday celebration! I find that very impressive that they recognized you from TV. I can imagine having that I know them from somewhere feeling but maybe I'm too unobservant to place someone. Anyway, can't wait to hear more about baby Hart #2! So glad you had such a wonderful birthday! You deserve every bit of it! My favorite thing in the world (besides my niece and nephew) is being surprised! And so I hope my husband can plan things like this for me someday! Funny, my days are filled with wiping poop and changing diapers too! I only wish they were baby butts and baby diapers!